NEW YORK (CNS) — The multilayered plot of “The Nut Job” (Open Road) might confuse smaller children. However, this animated feature’s continuous action and theme of the importance of living in community make it both splendidly entertaining and morally appealing. Not all the humor will please accompanying parents, though. Potty jokes seem to have become an unavoidable ingredient in children’s movies, and “The Nut Job” is no exception. In this case, the flatulence afflicting the hardworking groundhogs who populate the film serves as an unfortunate go-to gag. Still, director and co-writer (with Lorne Cameron) Peter Lepeniotis keeps this aspect of the proceedings reasonably restrained. Surly the squirrel (voiced by Will Arnett) is a lone operative in a parkland community of critters who rely on Raccoon (voice of Liam Neeson) to supervise their coordinated gathering of the wintertime food supply. When one of Surly’s elaborate plans to raid a nut vendor’s wagon goes explosively awry and destroys the oak tree holding their food stash, Raccoon and the others ban him from the park. Forced to fend for himself in a harsh urban landscape dominated by evil rats, Surly comes across a nut shop he regards as his holy grail. But his find raises a moral dilemma: Should he keep the contents of this treasure trove for himself or share it with the others? Though Surly makes the right choice, all is not what it seems. The store turns out to be a front for thieves who are tunneling into the bank next door. Loyalties shift as the animals learn to work together, build a new food supply and ultimately confront the truth. 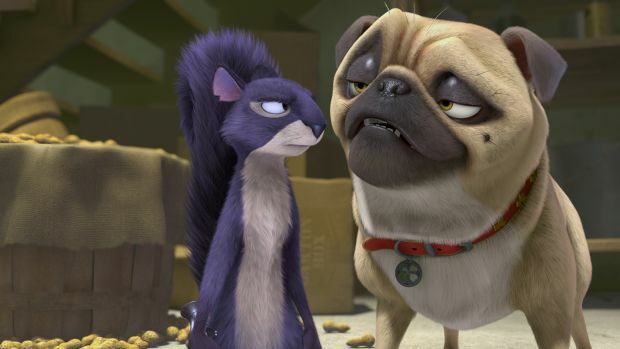 Surly longs for the affection and respect of Andie (voice of Katherine Heigl) and also learns to control Precious, a pug (voice of Maya Rudolph), in order to sneak around the robbers. With its action set in the 1950s, “The Nut Job” uses coal bins, cars with running boards and electric streetcars with overhead wires to create a nostalgic atmosphere grown-ups of a certain age will likely appreciate. The film contains some intense action scenes and mild scatological humor. The Catholic News Service classification is A-I — general patronage. The Motion Picture Association of America rating is PG — parental guidance suggested. Some material may not be suitable for children.